Home » andy griffith , crime , mount airy , vandalism » Is the Joker on the loose in Mayberry? Is the Joker on the loose in Mayberry? 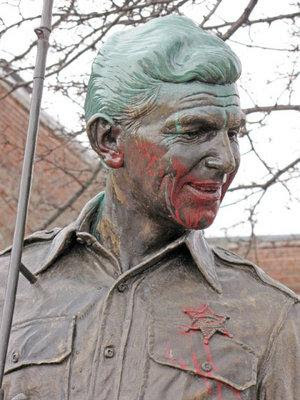 Over the weekend somebody vandalized the statue of Sheriff Andy Taylor that sits outside the Surry Arts Council building in Mount Airy, North Carolina. The statue depicts Mount Airy's most famous son, actor Andy Griffith, alongside his son Opie from The Andy Griffith Show. Sheriff Andy now has green hair and a red smile painted on his face. His sheriff's badge is also now colored red. Opie was unharmed. I don't think that whoever did this has any idea of the trouble they're in. This being North Carolina, and Mount Airy (the inspiration for Mayberry on the show) of all places, an attack on Sheriff Taylor is downright sacrilege. Sounds like the Joker is afoot in Mayberry. Time to load up your bullet Barney! I am so sad that a thing like this was done.My family and buses loaded with many others just like us enjoyed our day seeing a great work of art in honor of someone we have all enjoyed watching,including young and old.Hope it can be repaired.The person or persons need to be PUNISHED!! !